France, 2010, 101 minutes, Colour. Freddy Highmore, Ron Crawford, Penny Balfour. Voices of: Selena Gomez, Jimmy Fallon, Iggy Pop, Lou Reed. This is an immediate continuation of the second film in the series by Luc Besson, animated, the world of Patrice Garcia. In this story, Maltazsard been able to transform himself into human, super high size, and threatens the local town, wanting absolute power. He is confronted by Arthur, Princess Rainier and Betameche, voiced by Freddy Highmore, Selena Gomez, Jimmy Fallon. There are amusing adventures in the confrontation between the very tall Maltzard and the reduced hero, ending with their mutual transformations and the defeat of Maltazard – with his son Darcos, voiced by Iggy Pop, becoming involved. But, the defeat of the evil villain, the security of the Minimoys, and a good future for Arthur means a happy ending. Plot: Following the second film of the series, Maltazard has assumed human size, and left Arthur in miniature. 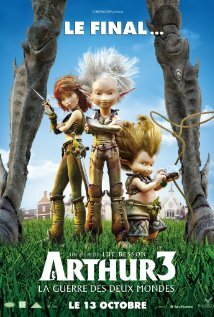 Accompanied by Selenia and Betameche, Arthur attempts to retrieve an enlarging potion from his house, which Maltazard seizes to enlarge his followers, whereafter Arthur returns to human form using an Elixir of Life given by a queen bee. Archibald convinces Darkos, Maltazard's son, to change sides, and enlarges him with a second potion. Arthur and Darkos then confront Maltazard, until Selenia and Betameche shrink Maltazard back to his Minimoy size and Arthur captures him, while the U.S. Army overcome Maltazard's forces. Maltazard thereafter remains a prisoner of Arthur's family. (Wikipedia summary).